Cart2Quote is the most complete Magento module that enables customers and shop owners to create a Request for Quote (RFQ’s) on Magento websites. With Cart2Quote you can effectively track customer quotations, edit quotation requests, create proposals and convert quotations to orders. 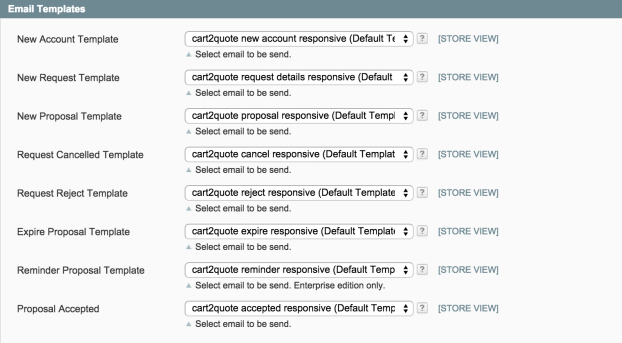 This all via the frontend or back-end of Magento or via the API web services available in Cart2Quote Enterprise. It is recommended you first install the module in a test Magento environment that is a copy of your live store. After you have verified the module works correctly in your test store, you can safely install the module in your live website. For a complete elaboration of all Cart2Quote functionalities, please refer to the User Manual. The User Manual explains Cart2Quote’s functionality from two perspectives: First from a customer perspective in the frontend and second from a shop admin perspective in the back-end. It is recommended to let the module be installed by a technical implementer when you do not have the necessary knowledge of Magento modules installations. The Cart2Quote module may require some changes to your existing template. Please consider purchasing the installation service. Backup your store database and web directory. You can backup your database through the Magento admin facility under the system-tools-backups menu. Backing up your files can usually be done through the configuration panel of your hosting provider. A database backup is also recommended. Download the extension from our website (from your client area in our store) and unzip the extension’s contents on your computer and navigate inside the extracted folder. To protect our intellectual property we have encrypted our software. Therefore you need to have ionCube installed on your server. Don’t know if you have ionCube? Ask your hosting company to find out. Require open source version? Buy or upgrade to our Cart2Quote Enterprise edition with open source option. For more information about IonCube and Cart2Quote, take a look at the support article on installing Cart2Quote IonCube files and the support article on installing IonCube on your server. This may not be an issue for many readers, but if you are using Magento’s compilation mode on your store, it is important that you remove it. Without going into too many details, compilation mode takes many files spread out over the system and condenses them into a single file that can be run very quickly. If the files of Cart2Quote are not in the system when this single file is ‘compiled’, they will not be included. If the compiler status is ‘Disabled’, you are ready to go. If not, simply click the ‘Disable’ button on the right hand side of the screen. The Magento front end relies heavily on caching to provide a faster experience to customers. This is a wonderful tool, but can wreak havoc during the installation process. To ensure that the cache is not the cause of any problems, we should turn it off. This can be done from the admin console by navigating to the cache management page, selecting all caches, clicking ‘disable’ from the drop-down menu, and submitting the change. Uninstalling Cart2Quote? 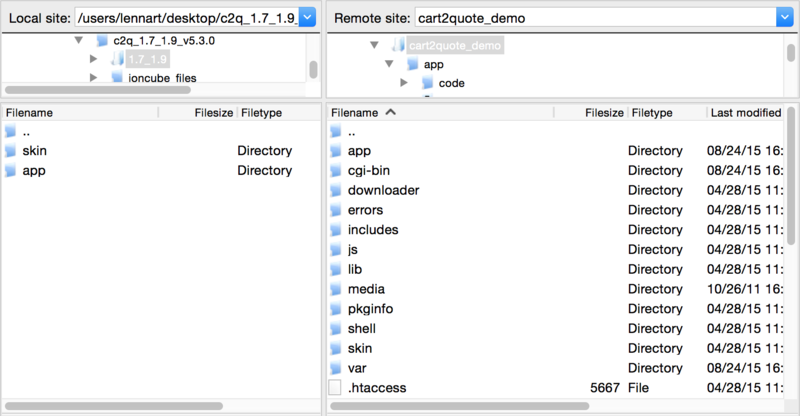 Do not test Cart2Quote on a production environment! Always make a backup of your store before the installation. Only install Cart2Quote on a production environment after thorough testing. 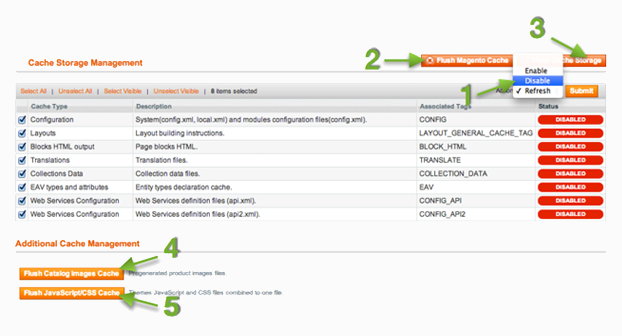 You can upload the content from the folder 1.7_1.9 to your Magento root. Your Magento root already contains the app and skin folders, by uploading you will add new files to the already existing folders. After uploading the Cart2Quote files, you need to upload the right IonCube files. Go to the ioncube_files folder, select the right IonCube version and upload this to your Magento root directory. Go to System->Cache Management and click ‘Flush Cache Storage’. This will ensure that everything cached by Magento is deleted and will be regenerated. Once everything works as expected you can enable the cache and the compiler mode again. Make sure you logout from your admin panel and login again. (else you will maybe see a 404 page). Step 7 and 8 eliminate almost all potential problems. If you have a paid version of Cart2Quote you can utilize all functionalities including those of the backend. The license key will be provided by Cart2Quote within 24 hours after your order is completed. The license key will be sent to the registered email address and can also be found in your account dashboard. Without a license you will not be able to create quotes in the Magento admin, create proposals, convert quotes into orders, track your leads etc. Experiencing installations difficulties? Go to our User Forum to see the solution for the most common problems. Or consider buying our installation service or Technical support tickets. You can test the module on your local machines with full functionality with the provided key. When you install the software online, without purchasing a license, only the free and basic functionalities of Cart2Quote will be enabled. You will need to set the extension to enabled. This section will walk you through a basic Cart2Quote configuration. First the module needs to be enabled. Only use Cart2Quote’s backend functionality? Disable “Use Built-in Template Files”, “Detail page activation” and “List/Grid page activation”. This way, Cart2Quote functionality will be disabled for the front-end. When you have a custom template or theme installed, you can integrate Cart2Quote properly by following the steps in the Cart2Quote theme integration manual. By disabling “Detail page activation” and “List/Grid page activation”, you will have to compare Cart2Quotes’s template files with your custom theme files and manually paste relevant code in it. 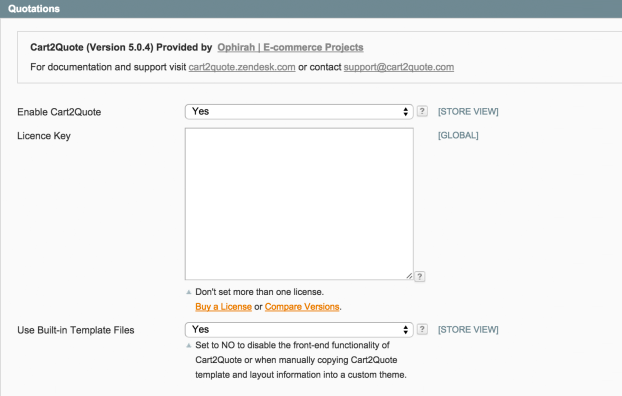 Since version 4.1.5 Cart2Quote supports all Magento tax settings. Your catalog base prices can be set to including or excluding tax. Cart2Quote will follow the behavior of the Magento tax settings, but we recommend entering the prices in the backend excluding tax. Cart2Quote relies on the flat rate option to correctly display the shipping information on the quote. You can turn on the flat rate in the configuration of Magento. Open a product and set “Allow Quote Requests” to “Yes” and Save the page. Go to the front-end and add this product to the quotation list, enter your details, submit the form and process the quotation in the backend, submit it back to the customer and, as a customer accept and checkout, with the proposed prices. Now do the same from the backend; add this product to the quotation list, enter your details, submit the form and process the quotation in the backend, submit it back to the customer and, as a customer accept and checkout, with the proposed prices. 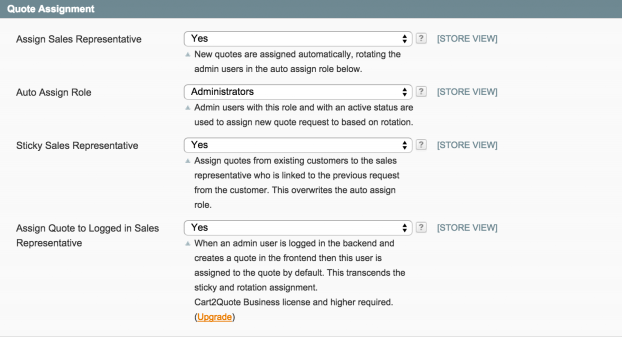 In this section, Cart2Quote’s configuration screen in the back-end will be explained. The most relevant items in each tab of the configuration of Cart2Quote in the Magento Admin Panel will be discussed in further detail. With the “Enabled” option you can choose to enable/disable the output Cart2Quote produces. This means that when the option is set to “Disabled”, you should not see anything related to Cart2Quote in the front-end. However the Cart2Quote extension will remain active and accessible in your admin section. 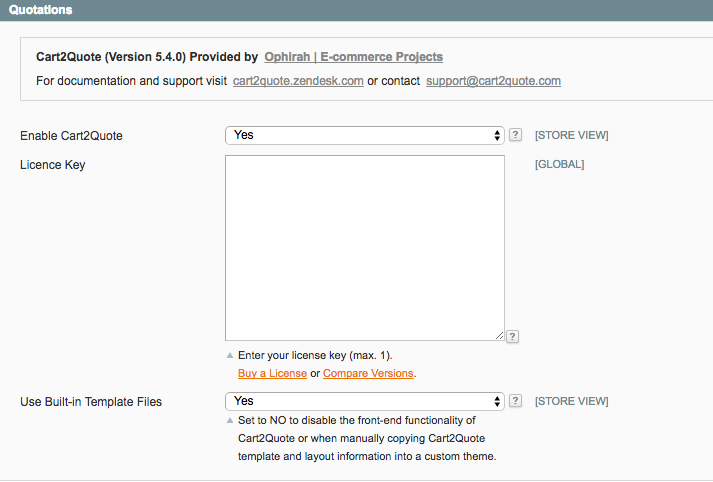 For almost all versions of the Cart2Quote extension a license key is required. The only exception to this is when you are using the trial version, in this case you can leave the “License key” field blank. If you’re using license keys for multiple domains, be sure to separate them with a semicolon “;”. To learn more about the different versions available check our editions and pricing. If this option is set to “No”, you have to manually copy the Cart2Quote template and layout information to your own template and layout files to enable the front-end functionality. Cart2Quote will be disabled completely for the front-end. When you already have a custom template/theme installed, it is advised to set the options “Detail page activation” and ‘List/Grid page activation’ to “No”. Cart2Quote will not overwrite your theme files for these pages. By selecting “No” you will have to compare Cart2Quotes’s template files with your custom theme files and manually paste relevant code in it. Simply prevent your customers from seeing your prices when the order functionality is disabled. Enable or disable the order functionality for any individual product, product range, storeview, store or complete website. Optionally show prices only to registered customers. This extension gives you full control over which products should show prices and add-to-cart buttons and which ones have their prices and/or Add to Cart button hidden. Go to the website of Not2Order for more information and buying options. Enable/disable the ‘Add to Quote button’ in the front-end layout for the product detail page. Enable/disable the ‘Add to Quote button’ in the front-end layout for the product List/Grid page. Set this option to “Yes” if you want to show a dialog with the message that your product is added to the quotation list instead of going to the quotation list or a notification depending on what is chosen in the option General – After adding a product redirect to quotation list. Set this option to “Yes” if you want to hide Shopping cart related buttons on the request for quote page. If you choose not to user the order functionality please consider using Not2order. Set this option to “Yes” if you want to hide the option to request quotes for multiple quantities per item. You can use this option to determine if a customer needs to be a registered user before submitting a request quote. If you set this option to “No” a login is required before submitting, when “Yes” is selected you don’t need to. This means any customer registered or not-registered can request a quote. If a not-registered customer requests a quote the customer automatically becomes a registered user with the information that was used for the request. When this option is set to “Yes” it is required to provide shipping details with a quote request. When this option is set to “Yes” requesting a quote will require billing details. When this option is set to “Yes” customers have the ability to sign up for the newsletter. When this option is set to “Yes” it hides the shipping details in the quotation overview of the client. When this option is set to “Yes” it disables requesting shipping quotes for guests and shipping quotes will only be available for logged in users. Set this option to “Yes” to show the telephone field and no to hide the telephone field on the quotation form. If this option is set to “Yes and required” the displayed telephone field is also required to fill out by the client in order to submit the quotation form. Set this option to “Yes” to show the company field and no to hide the company field on the quotation form. If this option is set to “Yes and required” the displayed company field is also required to fill out by the client in order to submit the quotation form. Set this option to “Yes” to show the VAT number field and no to hide the VAT number field on the quotation form. If this option is set to “Yes and required” the displayed VAT number field is also required to fill out by the client in order to submit the quotation form. Set this option to ‘Yes’ to show the State field and no to hide the State field within the address details on the quotation form. If this option is set to ‘Yes and required’ the displayed State field is also required to fill out by the client in order to submit the quotation form. Note: The address details are only visible if a guest or user has to enter shipping details. With this option you can select the sender from which the e-mail will be sent. Specify the e-mail addresses where a copy of the quote will be sent to. If you are using multiple addresses use a semicolon “;” to separate these. Select “Yes” if you a want to send a BCC to the assigned sales representative. Here you can specify the e-mail template for the e-mail that is sent when an account is created or choose to disable sending this e-mail. Here you can specify the e-mail templates for the e-mail that is sent when a new request for a quote is made or choose to disable sending this e-mail. Here you can specify the e-mail template for the e-mail that is sent when a new proposal for a quote is made or choose to disable sending this e-mail. Here you can specify the e-mail template for the e-mail that is sent when a request is cancelled or choose to disable sending this e-mail. Here you can specify the e-mail template that is sent when a request is rejected or choose to disable sending this e-mail. Here you can specify the e-mail template for the e-mail that is sent when a proposal is expired or choose to disable sending this e-mail. Here you can specify the e-mail template for the e-mail that is sent as a reminder for the proposal or choose to disable sending this e-mail. Here you can specify the e-mail template for the e-mail that is sent when the proposal is accepted or choose to disable sending this e-mail. If you set this option to “Yes” a PDF is created when a proposal is submitted and will be attached to the email. Set this option to “Yes” if you want to include the short description of the product(s) in the PDF file. With this option you can select a file that will be attached to the proposal e-mail (i.e. Terms and Conditions). Note: Some providers may limit the size of e-mails. With this option you can set the number of days it takes for a quote proposal to expire. This option determines after how many days a reminder will be sent for active quotes. Set the value to “0” to disable the reminder feature. When this option is set to “Yes” a proposal will be sent automatically based on the standard (tier) prices of the product. When set to “Yes” proposal items cannot be removed or added from a quote via the shopping cart when the quote is confirmed. Set this option to “No” to hide the individual item prices in PDF, E-mail and Customer dashboard. By default these will now only show total prices. Set this option to “Yes” if you want your customers to see the total quote adjustment. When this is option is set to “Yes” you will be allowed to send a proposal that has a negative profit. With this option you can set a default remark for your proposals that will appear in the proposal e-mails and PDF. Here you can define the prefix that is used for numbering your quotes. Note: The quote number is a combination of the quote prefix and a numeral value. Here you can define the current numeral value. This is automatically set to the last one that is used. Here you can set the value with which the numeral value part of the quote number should increment. Here you can specify the length of the numeral part of the quote number. If this is set 0 or is left empty then it will add leading zero’s meaning it will just have the incremented value as numeral part. 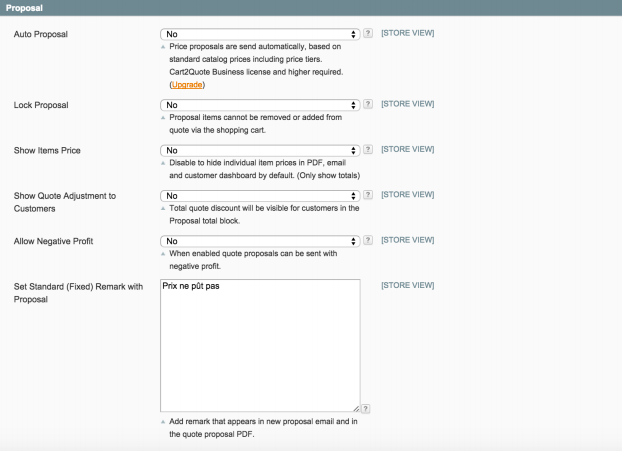 By selecting “Yes” an admin user will be assigned as sales representative when a quote request is created. As default the user will be selected from a pool of users that have the role as is specified in the option “Auto assign role”. The assigning of users will happen in a rotating fashion. Here you can choose the role from which the Auto Assign function should pick the users as a sales representative for a newly created quote. Please note: Included in the Business version is the ability to link specific sales representatives to customers and quotes. When using this feature it comes in handy to be able to show the details of this linked sales representative in the e-mails regarding the quotation. This way, customers can get in contact directly with the person that created or will create the quote. When this option is set to “Yes” a newly created quote will be assigned to the sales representative that handled previous quote from this customer. If this is the first quote the customer has created then one of the other assigning methods applies. Setting this option to “Yes” means when a user is logged in the back-end while creating a quote in the frontend the quote will be automatically assigned to that user. This option transcends the auto assign by role and previous quote behavior. Set this option to “Yes” to enable client messaging for the Cart2Quote quotations module. Select the default messaging template. By default messages from the CRM extension will be sent using this message template. With the “Beta Features” option you can choose to use the beta features that are available. If this option is set to “Yes”, you can use all the Beta features that are included in your installed version of the Cart2Quote extension. To check which Beta features are available for you, please visit our release notes and look for your Cart2Quote version. Set this option to “Yes” to make new products quotable by default. Set this option to “Yes” if you have issues sending e-mails. Cart2Quote will then log the e-mail actions. Make sure Magento logging is enabled. By default uploaded files within the Cart2Quote extension will we located at /media/qquoteadv/. If you upload files that are attached to a quote they will be placed in a sub-folder named after the ID of that particular quote. With this option you can change only the folder where files are stored that are attached to a quote. Set this option to “Yes” to hide quotes in the overview that have an expired follow up date in the admin section. Set this option to “Yes” if you want to make use of internal comments. These comments will only be visible for back-end users and not for the customers. When this option is set to “Yes” the quote totals will be loaded on page load. This can dramatically increase load time. We recommend setting this option to “No”. When an admin edits the products on a quote, the original price can be overwritten by the custom price. This option disables that. Note: It uses the default product price and doesn’t use any vat/tax/multi-currency calculation. checkout. Before sending the proposal e-mail to the customer, Cart2Quote generates a random number token (a large enough number to prevent guessing). Here you can define your checkout URL. When you use Magento’s default ckeckout page use the value “checkout/onepage/index”. If you want to use an alternative checkout onepage with the Cart2Quote extension, please replace the value with the alternative URL. When this option is set to “Yes” you are able to use an alternative checkout URL. With this option you can allow or disallow quote requests for mass updating products. Set this option to “Yes” if you want the product(s) specified in the field “Product id ranges” to be allowed for quote requests. the grid. This page is found in the menu “Catalog”, when logged in to the back-end. Important note: You need to be sure that the id’s you specified are indeed product id’s, because your database will be directly updated with these values. For general instructions, troubleshooting and best practices installing Magento extensions check out this article. You will find more specific development en configuration tips in our forums. Please feel free to share any tips and tricks in our user forum: Cart2Quote development and configuration help forums. This manual is accompanied by a User Manual. This manual explains how your website visitor will experience Magento Quotations in the front-end and it shows how a shop admin is able to process quotation requests on a daily basis in the back-end. We have also added a help tool for all the options in the Cart2Quote configuration settings. Just hoover over the question mark and a help text will appear. Cart2Quote Enterprise users can also use our API. For more information download the API manual of Cart2Quote. It is strongly recommended to let this Magento Quotation Module be installed by a technical implementer when you do not have the necessary knowledge of Magento modules’ installations. Cart2Quote has a core team of experienced professionals who are dedicated to offering Cart2Quote software installation, configuration and fine-tuning. Order installation or development support here.